Did you know homes with pools and yards can use as much as 70 percent of their water outside? Switching lawns for desert landscaping will save you money on your water bill and there may be landscape rebates available in your area! Not sure of your water district? Check out this interactive map to get more information about landscape rebates for your district. 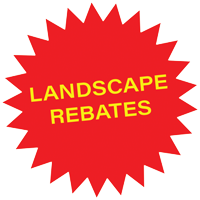 There may also be city landscape rebate programs available in your area. Sand, decomposed granite (DG), decorative crushed rock, cobbles and pebbles are great alternatives to grass. You don’t have to water or mow them! Whitewater Rock has a wide range of beautiful landscape rock and boulders that are low maintenance and require no water usage. Check out our famous Palm Springs Gold products. We also carry a complete line of fireplaces, gas log sets, BBQs, fountains and statuaries that can create an outdoor kitchen, gathering space or add a focal point to your new landscaping. Swap out water intensive plants for drought tolerant plants and watch your yard bloom. There are many native plants that bloom throughout the year. Water runoff is like sending money down the drain. But did you know standing water is also where mosquitoes lay their eggs? You can protect your family from mosquito-borne diseases like West Nile virus by reducing runoff in your yard. 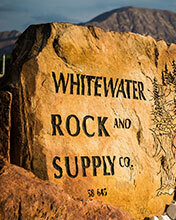 Whitewater Rock and Supply Co. provides our customers with the highest quality product and unmatched customer service at a fair price. Stop by and browse our retail rock yard have some free coffee and popcorn, and talk to our knowledgeable sales staff.